A Different Kind of Order: The ICP Triennial 2013, a global survey of contemporary photography and video, is on view at the International Center of Photography (1133 Avenue of the Americas at 43rd Street, NYC) since May 17 through September 8, 2013. Filling ICP’s entire gallery space as well as its exterior windows, the exhibition features 28 emerging and established artists from 14 countries whose works speak to and illuminate the new visual and social territory in which image making operates today. Artists include Nayland Blake, A.K. Burns, Thomas Hirschhorn, Elliott Hundley, Gideon Mendel, Wangechi Mutu, Sohei Nishino, Lisa Oppenheim, and Nica Ross. A complete list is below. 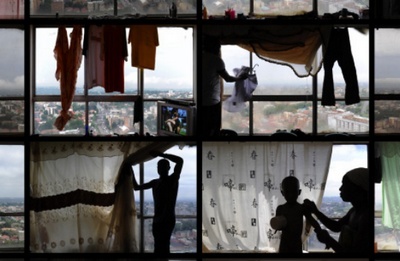 Windows, Ponte City 212.857.0045 (detail), 2008-2010. Starting from the premise that most photography is now produced, processed, and distributed in digital form, A Different Kind of Order explores the sometimes unanticipated consequences of this shift as revealed in the work of a wide range of international artists. For the younger artists in the Triennial, the digital revolution is something that happened during their childhood, and dealing with its ramifications has occupied most of their creative lives. For artists of this generation (such as Sam Falls, Andrea Longacre-White, and Oliver Laric), mixing the new idioms of digital imagemaking with the existing visual language of painting, sculpture, and collage is almost second nature. Other Triennial artists, wary of the advent of “screen culture,” emphasize the handmade qualities of their work, yet even they recognize that their efforts are situated within the space of a fully digitized, networked world. • Artist as aggregator identifies one of the main aesthetic offshoots of the digital image environment: the present-day descendants of the “image scavengers” of the 1980s who are now busy plundering and reorganizing found, online photographs into highly personal, web-based archives. • The resurgence of collage is evident in works that combine photographic fragments, digital images, paint, three-dimensional objects, and audio and video material to blast open and reconfigure the space of the photograph in unprecedented ways. • At a time when all manner of power structures are being called into question, mapping has become a renewed subject of artistic inquiry—part of a wider fascination with the power of ordering systems that has emerged in response to the dematerialized disorder of the Internet’s environment. • The Internet’s dissolution of geographic distance has spurred the development of new forms of community, allowing artists to explore new forms of connection, collaboration, and multiple authorship that do not depend on physical proximity. • In cooperation with ICP Associate Librarian Matthew Carson, the exhibition will also include an installation of approximately 100 recent photo books, which testifies to the extraordinary boom in selfpublished and small-press photo books now occurring around the world. A Different Kind of Order: The ICP Triennial was organized by ICP curators Kristen Lubben, Christopher Phillips, Carol Squiers, and Joanna Lehan. See below for curator biographies. Kristen Lubben, Curator and Associate Director of Exhibitions at ICP, has been a member of the curatorial staff since 1998. She has organized many exhibitions focusing on documentary practice, gender, and politics, including Susan Meiselas: In History, Magnum Contacts, Gerda Taro, Amelia Earhart: Image and Icon, and El Salvador: Work of Thirty Photographers. Kristen Lubben is the author and editor of several publications, including Magnum Contact Sheets (Thames & Hudson) and the catalogue for the exhibition In History. Christopher Phillips, ICP Curator, organizes exhibitions of historic and contemporary photography. In 2004, he and Wu Hung of the University of Chicago organized the first major U.S. exhibition of Chinese contemporary photography, Between Past and Future: New Photography and Video from China. He has curated exhibitions including Atta Kim: On-Air (2006), Heavy Light: Recent Photography and Video from Japan (2008), and Wang Qingsong: When Worlds Collide (2011). He is an adjunct faculty member at New York University and Barnard College, where he teaches classes in the history and criticism of photography. Carol Squiers, ICP Curator, has organized exhibitions on a range of subjects, includ¬ing contemporary art, fashion photography, and the intersection of science, technology, and photography. She has published extensively in periodicals, books, and catalogues, and is the editor of the collections Over Exposed: Essays on Contemporary Photography (2000) and The Critical Image (1990), co-author with Vince Aletti of Avedon Fashion: 1944–2000 (2009), and author of The Body at Risk: Photography of Disorder, Illness, and Healing (2005). Joanna Lehan, Assistant Curator at ICP, co-organized Strangers: the First ICP Triennial of Photography and Video in 2003 and the second Triennial, Ecotopia, in 2006. As a book editor for Aperture Foundation, she organized monographs by artists Thomas Ruff, Susan Meiselas, Zwelethu Mthethwa, and Hank Willis Thomas, among others. She has contributed essays to several photographic monographs, has served as a consultant to The Walther Collection, a private photographic collection and museum in Germany and New York, and has worked as a photo editor, researcher, and columnist. A fully illustrated catalogue, produced by ICP in partnership with DelMonico Books • Prestel, accompanies the exhibition. It includes sections dedicated to individual artists and contributions by ICP curators.